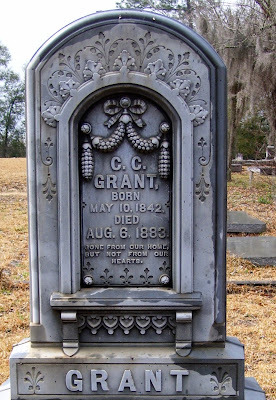 C. C. Grant's tombstone was made by the Monumental Bronze Co. of Bridgeport, CT. It is located in Felton Cemetery at Montezuma, Georgia. I love these headstones. I'm hoping to collect all of mine into one album. The details just amaze me. Me, too, Gale! They stand out nicely in the cemeteries down here, so I always head straight for them to get a picture. This one actually had "Monumental Bronze Co. Bridgeport, Ct." on the back. Most of the ones I've seen around here don't have it.